This was actually finished yesterday, but the ungrateful tyke independent, strong-willed toddler, wouldn't put it on and pose. I'm very proud of Kate's sweater because I finally figured out how to do the seams properly and they look really good. Not to mention, I did it with a horrible cold, when I would much rather have been sleeping. Unfortunately, I couldn't keep going forever and when I tried to sew together her doll's sweater, things didn't go so well. I'll fix it up when I get better. I may also re-do Emma's sweater now that I know how to seam. Click on any of the pictures to see more on Flickr. The first child and doll sweaters are finished! This is a Flickr badge showing photos in a set called Emma's sweater. Make your own badge here. The second child and doll sweaters are ready to sew together. Check back for more photos soon. 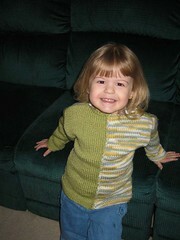 I began putting the sweater for my 5 year old together last night. Since it consists of two panels sewn together for the front and two for the back, not to mention side, shoulder, and arm seams, there is a lot of sewing to do. Yikes! The front and back panels are sewn together in reverse to create a decorative raised seam on the outside of the sweater. I knit and finished a sweater for her American Girl doll first, just so I could practice putting it together. 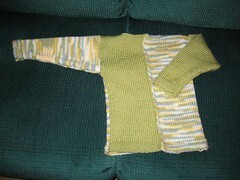 The sweater for my 3 year old is coming along, but I'm doubtful it will be finished before the end of the Games. That's okay, though, since it wasn't part of my original goal anyway. (And who knows, I may still make it, if my fingers can keep grasping the needles) One of her dolls will get a matching sweater too. 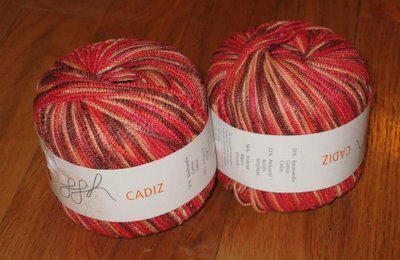 Two balls of Cadiz by GGH, a worsted weight, plied yarn made in Italy. 51% cotton, 33% acrylic and 16% rayon. Each ball is 104 yds/50 gms; gauge is 17 st/inch on size 7/8 US needles. The colorway is Terra Cotta. This prize is going to be given for the best Knitting Olympic blog entry. 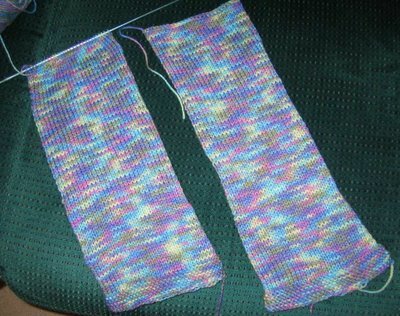 Keep knitting and blogging, everyone, we're almost there! Much of my writing seems to straddle the fine line of prose and poetry. 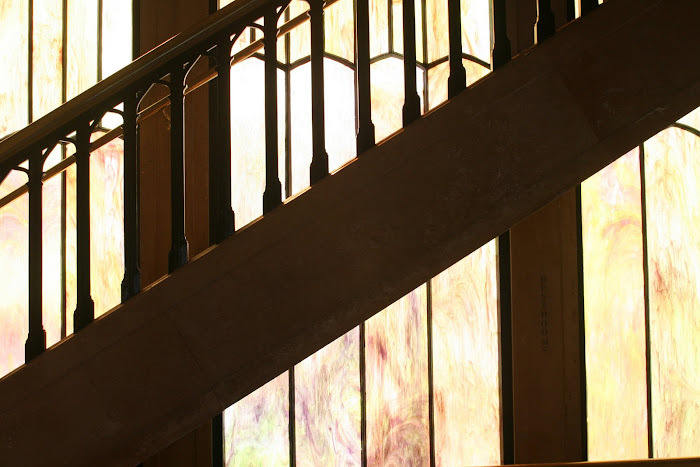 I find readers often asking whether a piece is a prose poem or flash fiction. In my mind, the category is irrelevant, but that only holds up until I begin submitting my work and have to decide whether to send it to the fiction editor or the poetry editor. I just finished reading Issue No. 3 of Sentence: A Journal of Prose Poetics, and am wonderfully surprised by the variety of writing they include, as well as their attention to the debate over what constitutes prose versus poetry versus prose poetry. Many of the pieces in this issue are experimental. They push the boundaries of story and poem in new directions. I have noticed in my travels that people do not put Kleenex out for guests. They do not even put out trash cans to put the Kleenex in that they do not put out. I have noticed in my travels that people do not put towels in their restrooms for their guests to wipe their hands on after they wash their hands. I have spent much time meditating on why this is so as I have waited for my hands to dry, usually in a dog paddling or bicycle tire pumping manner. I confess I sometimes discretely (sic) use their decorative towels to wipe my hands on, but I always feel guilty and end up rolling around on the floor asking the host to please forgive me. About half of the hosts do forgive me and the other half usually include the shell in the scrambled eggs they cook for me at breakfast. I crunch and smile and determine to mend my ways, but decorative towels loved this much make me want to puke on them, but I don't like to get sick so I'll just go on meditating while my hands dry. I have noticed in my travels that people do not put a lamp near enough to the guest bed if at all. Aha I see now. I do not need a Kleenex, a trash can, a hand towel, or a lamp because I am A Traveling Monk and I meditate, I meditate, I meditate, and I meditate in the dark. Leaving the dusting and dishes, you go outside. Here, the pots need water, dead flowers beheading, stiffened sheets unpegging. And the plums all down the driveway writhe with flies and wasps, their frantic buzzing reaching you like music swelling. The sun bakes, turns everything to dust. You want to wring your hands in the way you have seen your grandmother do many times. You want to see a child's neck bent over a buttercup, completely still. 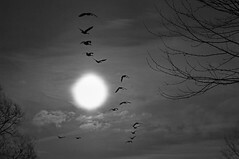 Or a bird take flight. You want something. Anything. You are waiting for it like waiting for a storm. You feel like crying. The wind never rises. The light blinds. And going in, the darkness takes time to clear. Once upon a time there was a skeleton. When I noticed, I started to throw sandwiches at him. Soon, stretchy aliens were on the attack! Next, the pipecleaners had sent the stretchy aliens to jail. The pipecleaners never let the stretchy aliens out. Suddenly, the stretchy aliens slipped between the bars! The End. Unfortunately, I can't get my scanner to work, or I'd post the accompanying illustration of the skeleton and stretchy aliens. When you cast on, don’t hesitate. shape the way for yourself. the forward and backward simplicity of existence. when small children are around. If you drop a stitch, pick it up as soon as possible. than rip out rows of indifference. Learn about yarn-overs: sometimes holes are on purpose. cast off. Weave in the loose ends. Give a gift to someone you love. Olympic Update: The first sweater is done and being blocked. The second sweater is started. 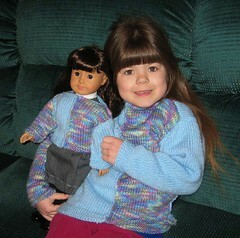 I'm also adding matching doll sweaters for each girl, and the first of the doll sweaters is nearly finished. Check back in a day or two for pictures. My poem Anatomy of a Tomboy is up this week at Salome! I'm well on the way with my first-ever sweater. It's a very simple pattern, made up of two panels (one multicolor, one solid) sewn together to form the front, two panels for the back, and the sleeves. I took this picture on Sunday night and finished that second panel shortly afterward. I'm now nearly done with the first of the solid color panels. Even taking into account blocking and sewing it all together (HELP! I could really use some tips and guidance on sewing the seams together), this is clearly not going to take 16 days to complete. Therefore, I've decided to add another sweater to my Olympic project. It will be the same, only smaller and possibly different yarn, for my younger daughter. Check out Flash Bang Fibers for a list of the USA Team First Sweater participants and continued updates on everyone's progress. Originally uploaded by under the influence of dub. Okay, I'll admit it. There are only four shows I actually watch on television anymore, and three of them are on SciFi. Both Stargate SG-1 and Stargate Atlantis have consistently good writing and well-developed characters. Watching them is like curling up with a favorite book or visiting old friends. Battlestar Galactica is unlike any other show I've ever seen. It's always startling, emotionally real, and courageous enough to go to the darkest places in the human heart and mind. This is a show that will rip you to pieces one minute and leave you with unexpected hope the next. And yes, I thoroughly enjoy watching Firefly, which we have on DVD. Despite being cancelled after less than a full first season, this show was so wildly popular with fans that the creator, Joss Whedon, was able to produce the theatrical movie Serenity on the basis of their support. Check out the show and the movie, and you'll know why the fans just can't let these characters go.